I'm working on getting an airport site. My in at the airport is the operations manager at McGhee. If there was a person that could get us the site, it would be him. He should also be able to give us an explanation of how other regions might be getting sites at active airports. I dont know how to send them to you but there are very specific rules for FAA closure. You probably need to find those on the FAA site and take those with you. It has been some time since I reviewed them but one of the factors as I recall is what benefit(financial and otherwise) to the local airport comes from the closure. Driver education might be the way! I have somehow been put in the loop on some email discussion list about airport autocrosses. I will recreate it below. My name is Dale Willey and I am the President of the Sierra Sports Car Club in Sierra Vista, Az. We have, for many years, used a parking ramp on the city’s airport to run SCCA sanctioned events and recently the city asked us to produce a letter from the FAA granting permission to use the facility. We haven’t been required to gain FAA approval in the past so I’m puzzled by the city requiring us to be granted approval now. Your names and email addresses have been provided to us by the SCCA as the points of contact for other clubs that used airport facilities in 2009. I am contacting the regional FAA office having purview over the airport here but wanted to know if any of you have been required to produce a similar document. If so, what were the obstacles you ran into in gaining approval; can you provide me a template letter you submitted to the FAA? The L.A. region hasn't been running on any active airports so that's outside our experience. I think National had to work this out for Lincoln. You may want to get in touch with Topeka and see if they have any suggestions. We have recently gone through this in the Central PA Region. Up to 2008 we ran events at a very small non-commercial airport with approval only from the local airport authority, but in 2009 we were told the FAA would no longer allow events to be held there. There is a lot of red tape regarding using an airport for a "non-aeronautical event" (I could talk for hours about the political and financial rationale/irrationality of this rule). This put a HUGE dent in our club's Solo program, so we fought it hard and now have received approval to hold a certain number of events there per year. If you use your airport in such a way that you do not disrupt the flow of air traffic to ANY parts of the airport (hangars, fuel tanks, etc. ), and such that there are physical barriers (e.g. a fence) enforcing the division between SCCA activities and airport activities, then you can make a very easy argument for approval and you should have no problems. If, however, you are shutting down major portions of the airport, or blocking taxing aircraft, you will need to come up with a much more detailed plan for getting approval for your events. The layout of each particular airport can control the details of whether you're in bounds or out of bounds. In our experience it's really the State Bureau of Aviation that holds all the keys, not the FAA. The FAA makes the rules, but the state groups enforce them. We worked with people in the state Bureau of Aviation, who in turn work with the FAA to get approval. It is a rather painful process and takes a minimum of 2 months to get approval, but it's not impossible. I can send you the documentation we use in PA but it is unlikely that it will be a match for the way things are done in AZ. I suggest calling your state's Bureau of Aviation and trying to find yourself an advocate. If anybody in your club happens to be in the aviation community and has connections, or if you can somehow find a person in your state's Bureau of Aviation who is a car enthusiast, some doors may open more easily. Your airport's management may also join your team to fight for you, since you are probably paying them a rental fee and if you get shut down, they lose money. The Solo Nationals event was completely surrounded by an orange snow fence (where there was not already a grass or chain-link border). I'm told this had the effect of removing that entire area from "active airport" where aircraft might wander, and thus non-aviation activities could happen within that fenced-in area. SCCA and/or Nebraska Region also paid the airport $X per hole to go out and drill fenceholes in the concrete. Basically a one-time charge. Once drilled, the hole is there and the fence can be put up anytime (by people with the right training/credentials to go out on the tarmac). And we were told that anyone jumping the fence for any reason would likely get the event shut down (if there's a need, let airport security do it). As mentioned above, I have a pretty good contact at the Knoxville Airport. It's a friend/aquaintance that I have lunch with about once a month. They have an amazing piece of concrete that would be awesome for autocrossing. It's big (600' x 600' square), flat, smooth, and they have no use for it. I've asked about it before, and the response was that it's too close to the taxiways without any kind of physical barrier. After reading some of what Chris posted, I will look into this further while mentioning the possibility of ETRSCCA funding the physical barrier needed. I'm affraid we'll still be too close, but it's worth asking. This is the patch of concrete in question. I have also looked at that chunk of pavement while drooling, many times. I would be surprised if we could get access to it but it certainly doesn't hurt to try. I received those emails also and was very confused at first. Aaron I would take back everything I have said about you if you could get this site. In the Nebraska Region we had contracted directly with the airport authority for our events when we held them outside of the fence (not the active area of the airport) up until two years ago. In late 2008 we were able to hold an event inside of the active area where there were already fence post holes from when they hold airshows at the airport. This was dependent on us putting up and taking down the long lines of orange snow fence to create a "visual barrier" between the active side of the airport and the now "inactive" side where we could hold events. However this required us to have to pay for an airport security guard to watch the fence line at a generous overtime rate. In 2009 with the national office stepping in to negotiate their contract this allowed us to gain access to the site for three regional events (not counting the divisional championship). They paid for the fence post hole drilling that made up the national site, and I believe our region paid for the post holes that created the divisional area, all at X dollars per hole. In the meeting that I attended with the airport authority the one comment that stood out in my mind is that they "are not in the business of holding events." My understanding is that we never had to submit any letter like this regardless of if we were outside or inside of the "active" airport area. I would suggest contacting Howard Duncan from the national office he was involved with the national side of the contact negotiations, perhaps he knows something about all of this. I imagine that a parking structure is most likely outside of any active area of the airport so this sounds a bit suspicious to me. Although a solo event in a parking structure does sound amazingly interesting to me. Sounds like we would need some actual physical barriers. How much are they? Are they talking about the orange mesh fence looking things when they say "Snow barrier"...the stuff that is used like at constructions sites? I don't think that stuff would be that expensive...but we would probably have to get a pro to put holes in the slab. Aaron, if you need me to help on this one let me know and I will do my best. This may be a situation where we call in the big dogs to go have a meeting (Wayne, Scott, Dave). It helps that nationals are now held at an airport and it looks like multiple regions have had success getting airport facilities. as I read it, the holes being drilled and authorised person from the airport to place/remove the poles before/after events would be the main costs. Doubt the snow fence for the visual barrier would be too much. but then I have no clue how much it costs. It is worth looking into if the pavement is good and we could have decent sized courses. Worst that could happen is we get told "no" or find out it's too expensive. I pulled it up and got as close in as I could.. DAMM! thats a Prime piece uhh Granite!! how big is that??? and if we could pit/grid at the lot in front of the building just down the access road.... holy cow!!! 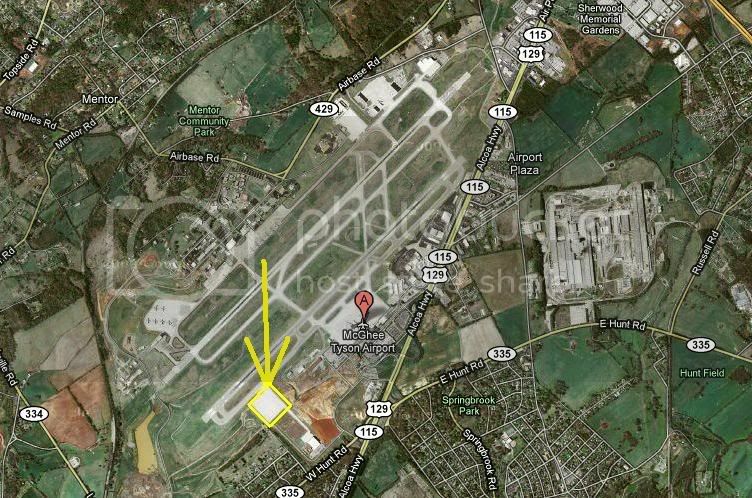 I think the lot size is closer to 600ft x 700ft using the scale on bing.com's map. If I get anything past, "No freaking way, are you kidding me?" I'll be sure to set up a meeting with my contact and a few people that know site acquisition pretty well. I'll keep everyone posted.